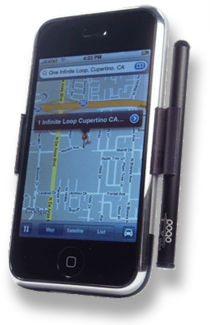 Ten One Design has released the Pogo Stylus designed specifically for the Apple iPhone and iPod Touch. The sleek design of the Pogo Stylus features an ultra-light aluminum body with an anodized finish and laser graphics. The foam tip is soft, yet durable and conforms cleanly and precisely to the multi-touch screen. Sized for accuracy, it does away with the awkward typos and misfires common to fingertip-only use. The $25 accessory is designed specifically for use on the iPhone's capacitance touch surface, which typically recognizes a finger touch only. Not sure how big a market there is for this accessory... but if you can't stand smudging your iPhone, this is for you.